AHM is proud to offer programs that address issues of prevention, intervention and positive youth development. We have an amazing, dedicated staff of highly trained professionals who collectively share the mission of supporting children and their families in our community. 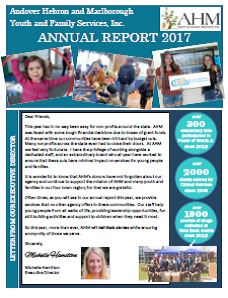 Please take a look at our 2016 – 2017 Annual Report. You can download a copy of our report here. To request Individual Town Data Summaries, please call the AHM office at 860-228-9488. We are so excited to be featured in the Hartford Foundation For Public Giving 2016 Annual Report. You can read our Nonprofit Profile: “Advancing youth, families and effective practices”, here.